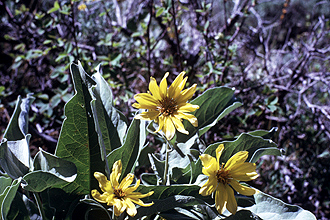 Arrowleaf balsamroot ranges from British Columbia south to California and east to Saskatchewan, North Dakota, and Colorado. It ranges in elevation from 300 to 2900 m.
It will tolerate semi-shade and can be found growing on open ridges, dry foothills, semiarid mountain rangelands, and southerly exposures. Balsamroot is a stress tolerator; it can withstand long periods of drought and high temperatures. Ponderosa pine, Douglas-fir, lodgepole pine. Harvest seed by hand or with a combine if terrain permits. Clean by drying, fanning, macerating, and fanning. A cool, moist stratification for eight to twelve weeks at 0-4°C is required to break dormancy. Seeds can be stored for up to five years. Seed can be stored at 20°C for up to five years. It prefers well-drained, deep, fine to medium textured soils and open dry situations. Best if planted as seed or seedlings grown in greenhouse. Moderate to no watering after it is established. Long lifespan, moderate growth rate, up to 2 feet.